An Arts and Crafts oak extending dining table with a sliding top that allows for the two extra leaves to be installed very quickly, a very simple but clever design. Length 48", two leaves 10 1/2" each, Total length 69" Width 41". Circa 1900. 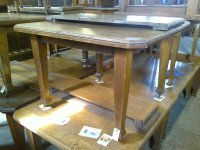 A good Arts and Crafts 1/4 sawn oak extending dining table with canted corners and two extra leaves, on square tapering legs with original brass and ceramic castors. Length without leaves 54", Length fully extended 6' 10", Width 41". Circa 1900. 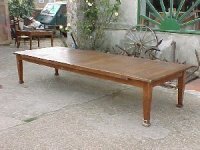 An Arts and Crafts 1/4 sawn oak six seater extending dining table with one extra leaf, on square tapering legs with original brass and ceramic castors, needs re finishing. Length without leaves 54", Length fully extended 5' 10", Width 41". Circa 1900. 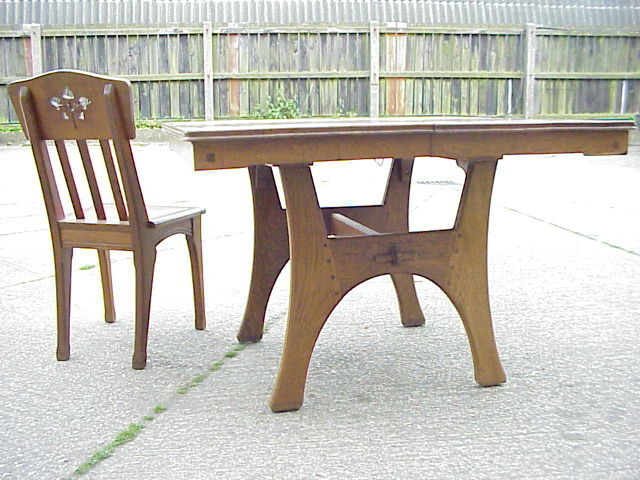 An Arts and Crafts extending dining table with curved ends. The original leaves are missing. It could be used as it is or have new leaves made then refinished to match. It is quite unusual because the extending mechanism slides out as opposed to winds out and it doesn't have castors but slightly longer legs and more elegant. Length without leaves 64 1/2", Width 46". If new leaves were made this table would extend to almost 9' long. Circa 1900. The price as the table is £800. A pair of quality Arts and Crafts/Gothic Revival oak dining tables which were made to be mated together. They will seat 14 or 18 with a central leaf. It has the facillity to accept a leaf in the centre to make an 18 seater. There are two slides at the centre end of each table that pull out to rest a leaf which is missing but we can make a replacement if required. They can also be used as two separate tables that would both seat eight. Measurements:- length 14' 10" or 2 x 7' 5", Width 4' 6". Circa 1890. 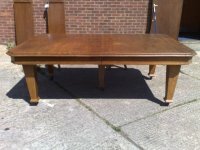 An impressive 16 seater Arts and Crafts oak dining table. This originally had two extending leaves which used to slide out from underneath at each end. We could easily have them made again if required which would make an overall length of 14' when fully extended. At present the table measures 11' 6" length and 4' wide. (The table has large decorative brass castors not shown in the images). 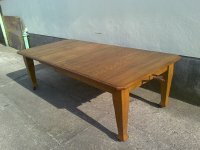 A good quality Arts and Crafts oak extending dining table with one 18" leaf. Circa 1905. Length closed 41", Length extended with leaf in place 5', Width 41". Length closed 41", Length with leaf 53 1/2", Width 41". Circa 1900. 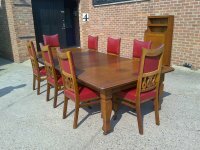 An Arts and Crafts style oak swivel and fold over dining table with cuttlery drawer to one end and square tapering legs. Width closed 24 1/2", Width Open 39", Length closed 39", Length Open 49", Circa 1910. 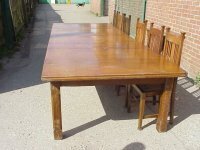 TB SOLD 50 A fourteen seat Arts and Crafts oak 'D' end extending dining table with four extra leaves. Surrounded by a set of fourteen elegant Arts and Crafts oak dining chairs with heart cut-outs to the curved and shaped head rails and conforming shaping to the back of the drop in seats a sweet reflecting detail. Length closed 67", it will fully extend to just under 12' long, each of the four leaves are 19" wide, Width 4' 6". Circa 1900. 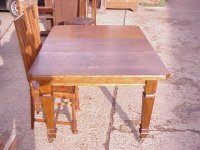 A good quality twelve seater Arts and Crafts extending oak dining table with two extra leaves. Length closed 70", Length with leaves in place 102", Width 47", . A Gothic revival oak extending dining table with three extra leaves, carved florets to each leg on brass and ceramic castors. Length closed without leaves in place 56", Length fully extended with three leaves in place 10', Width 51". Shapland and Petter. 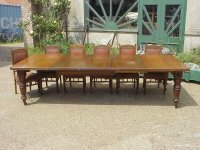 An Arts and Crafts Oak 14 seater extending dining table with three leaves and eight matching chairs. Two of the chairs are made slightly taller for use at each end. Wylie and Lochhead - A rare 16 foot long Arts and Crafts oak extending dining table with six original leaves. In original condition extending and retracting beautifully. Length closed 7', Length fully extended with all 6 leaves in place 16', Width 48". Circa 1900. A ten seater Arts and Crafts wind-out oak dining table with beautiful figured grain. It retains it's two original leaves extending it from 4'11 to 8' long. 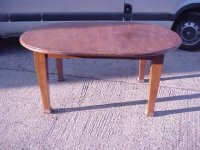 An Arts and Crafts 'round ended' wind-out extending dining table with two extra leaves 18" each. Length 6', Fully extended 9', Width 47 1'2". Circa 1895.